Kate and William started in sporty mood as they headed to Vasaparken in Stockholm to try out bandy hockey. The sport was invented in Cambridgeshire but is much more popular in Sweden than England. The royal couple had a go at shooting goals with William running out winner, 2-1. After meeting players, it was time to head to the Royal Palace. The Duke and Duchess of Cambridge were welcomed to Sweden by King Carl XVI Gustaf and Queen Silvia. They all had lunch together alongside Crown Princess Victoria and Prince Daniel. 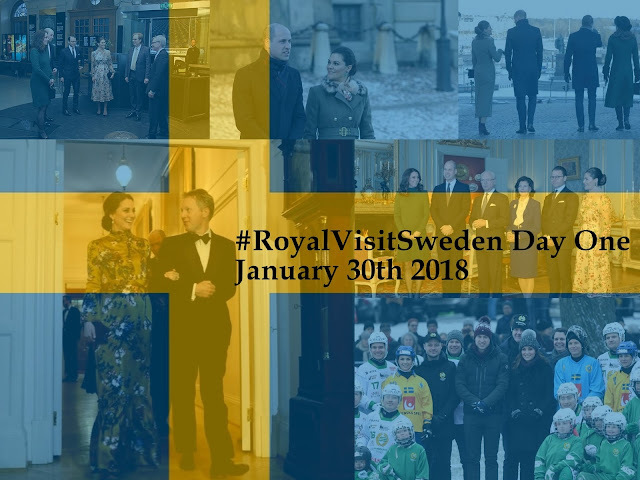 The heir to Sweden's throne and her husband were hosts to William and Kate for the rest of the day and what's not to love about the rather pretty walk the four of them took to Stortorget Square in Stockholm's Old City. From there it was a short stroll to the Nobel Museum where the royal foursome had a bit of a walkabout. Then it was inside for a spot of science and a chance to meet a former winner of the famous prize. William and Kate then headed to ArkDes, Sweden's national centre for architecture and design. Kate tried out an armchair as the couple heard about the work going on around Sweden and some of its most famous exports, including IKEA. Day one was rounded off with a black tie dinner at the British Embassy where the Duke and Duchess of Cambridge also met the Prime Minister of Sweden and his wife. Day two will see a focus on young people and mental health issues - #RoyalVisitSweden is well and truly under way. Photo credits: Kensington Palace Twitter and Kungahuset Instagram.